ad broad: must ambient ads be omnipresent? 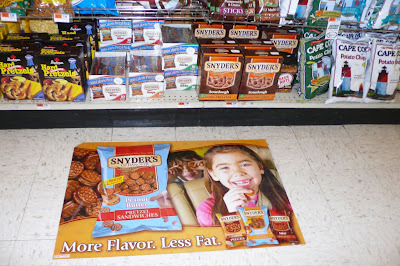 Nothing against practitioners of our fine profession, but do we really need posters under our feet for products in view on a shelf right in front of us? *The airport baggage carousel. Adclaim Inc. of Irving, Tex., has ads at the Dallas-Fort Worth International Airport and hopes to expand into entertainment-oriented cities like Las Vegas, Nev.; Orlando, Fla, and Miami. Local restaurants and limousine services especially like the location, said Hank Arendt, Adclaim's president. A 5-by-5-foot ad can be had for about $875 a month, he said. *The cash machine in your neighborhood. The Electronic Data Systems Corporation of Plano, Tex., began testing talking ads on automated teller machines in the San Diego area in November. Such ads may one day play nationwide, with advertisers paying perhaps 40 to 50 cents for each shot at a newly flush customer, said Dale Dentlinger, director of product management at EDS. *The local gas station. Rio Network Inc. of Raleigh, N.C., has installed television-like screens and speakers in gas pumps that gab as you fill your tank. The company's ads play outside 600 convenience stores around the country, with half the ads for products inside the store, said Louis Williford, president of Rio Network. His company gives grocers 20 percent of the revenues from advertisers, which average $300 to $700 a month per location. *The rental car. A New Jersey company, Kallet & Grant Associates, is preparing to roll out cassette-tape ads that will play in Avis rental cars picked up at airports, first in Philadelphia and, if the test goes well, expanding nationwide. Along with an overview of the city, new arrivals will hear pitches for local restaurants, hotels and other vendors, said Geoff Grant, president of Kallet & Grant. He said his company would give Avis perhaps 10 percent of the take from advertisers, who will probably pay about $1,500 a month for spots in a single city. The stupid stick they separate your groceries at the supermarket checkout conveyor from those of the next person in line. They'll paint the checkout girl's face next and call it ambient. Oh, yes! That stick! I feel sorry for those checkout people already being made to wear holiday costumes like Uncle Sam hats and sad looking reindeer antlers. You're right--can Pepsi costumes or face paint be far behind? This bench in LA when we were on tour. NJ Transit also has select seats with ads printed on the entire back. Awesome™!